NextHop address of the routing is basically to specify from among the segment of its Connected route.However, there is a case to be routed correctly even if in different segments of the NextHop.Moreover, it may even be in the IP address that does not exist in the NextHop is properly routed.This is because the recursive routing is operating. 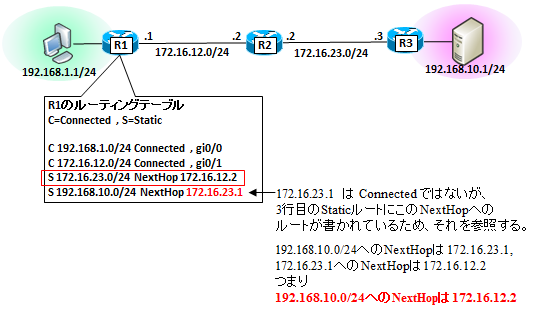 For example, in R1 of the following configuration, the place you must specify the 172.16.12.2 as NextHop to the 192.168.10.0 / 24, we have ended up with the 172.16.23.1. In this case, 172.16.23.1 is not in its own Connected (the first place does not even exist), but you set a Static route to the NW address, you refer to it. In other words, the NextHop to the 192.168.10.0/24 is 172.16.23.1, looking for a recursive routing table NextHop the 172.16.12.2 to 172.16.23.0/24, as a result you get a following. In this way the recursively Find router operating the routing table is called a Recursive Routing.  There is nothing which the Recursive Routing only can, probably. But I will show you one of the things that "if we use this way-to-use". 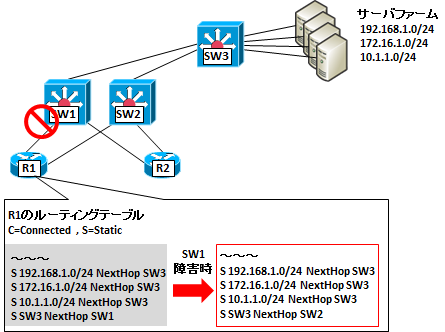 This is a technique to reduce the operational load, for example in the figure below the NW configuration, SW1 will consider the case to switch the route to the SW2 is in the event of a failure.In this case, if a segment of a server farm spans multiple, usually it requires the routing changes for all segments.However, if the IP address of the routing to the server farm SW3 as shown, be switched one route to SW3 in case of failure, it can be switched to all routes of the server farm.In the example is a three-segment, but if this is the Toka 20-30 segment, will come in handy.